Park of Joan Miro is also known as Parc de Joan Miro amongst the locals. It is a very charming park and boasts of a lot of natural beauty. 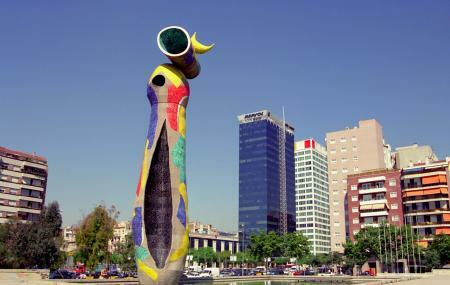 It is known of Park of Joan Miro for it features a very important work of the artist- Joan Miro. The park has a sculpture known as the ‘Bird and Woman’ which is a very famous sculpture by the aforementioned artist. The park is covered in large pines and palms and is one of the best town parks you will come across. How popular is Parc De Joan Miro? People normally club together Plaça D'Espanya and El Paballon De Barcelona while planning their visit to Parc De Joan Miro. A very lovely park with almost every amenity you could think of! An extensive portion for children of all ages including a miniature zip line. There's an adjacent well kept Field for football, as well as the dog park! There's even a library right next door and plenty of benches. It's April right now and the central prominade through the park is covered in wisteria which is in full bloom. The smell is amazing and there are lots of bees working away. Otherwise the park is a nice quiet place to sit and read or bring your dog to the small, enclosed space. The park is great to take a walk or just sit and enjoy the sunny weather and the wind. It might be amazing during the spring. The park is just beside the arena, that you can go on top and get a nice view from Barcelona. The park has a nice atmosphere. I recommend it strongly if you are in the area.